Map ideas like never before. "A picture is worth a thousand words". With SpiderScribe you can visualize your ideas by connecting various pieces of information together. 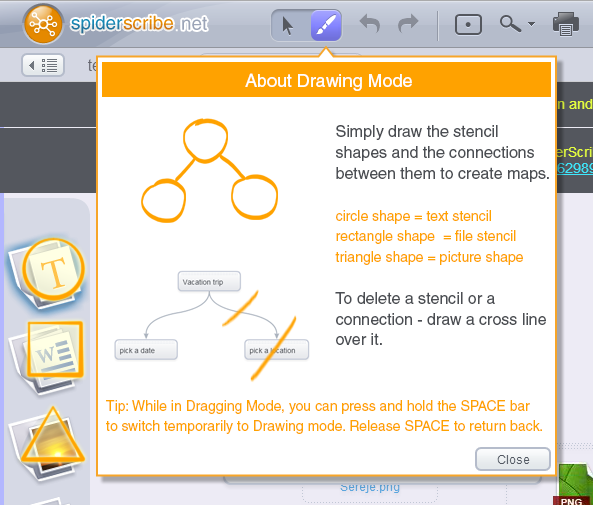 Unlike other mind mapping applications, SpiderScribe allows you to create free-style maps by connecting your stencils in any way. SpiderScribe.net is the easiest mind mapping app you might ever see. Text, images, files, events, etc. 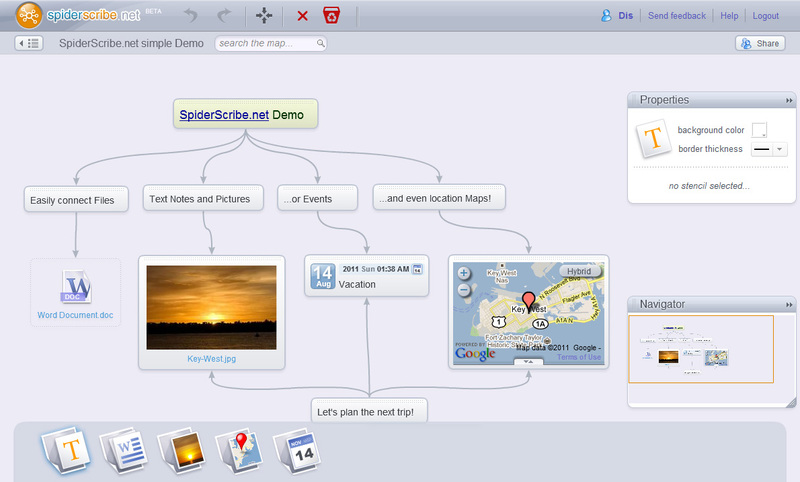 SpiderScribe maps can combine elements like text, images, files, calendar events and geographic locations. More type of stencils will be added in time. Stencils can be customized - change colors, resize, format, etc. You can create public and private maps. Private maps can be shared with others and multiple people can collaborate on them at the same time. 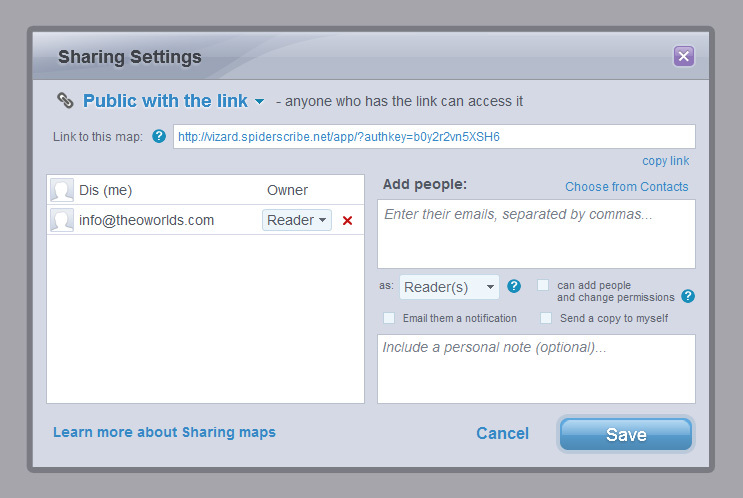 Public maps can be viewed by anybody, without having to login into SpiderScribe. Your collection of maps is stored online and can be accessed from anywhere, through internet. All you need is a web browser (Flash plugin is required). 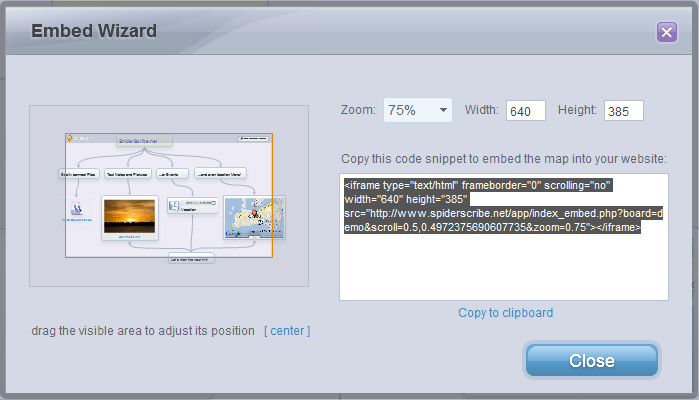 Embed SpiderScribe.net public maps into your website easily with our Embed Wizard. You can modify the map size, zoom level, even the visual area position and generate the embed code in one click. Drawing mode is a fun, alternative way to work on your mind maps. Simply draw a shape of a stencil – round one for the text (it does not have to be perfect), rectangular shape for a file and a triangle for a picture – and the stencil will be added to your screen. You can also draw lines to connect stencils or cross out connectors and stencils to delete them. Give it a try!